Ouch. Not what a self conscious teen wants to hear. OK, so I thought our original card design was clever at the time. But with a big, blaring “FamZoo” and the quaint “Good Money Habits. Together.” beneath it, the razzing was inevitable. And that, parents told us, is exactly what happened. Face palm. So, we just ditched the original design. Teeny-tiny “FamZoo” in the upper right corner. I told you it was minimalist. From now on, it’s shame-free spending for kids, tweens, and teens. Of course, we hope that won’t translate to more spending. If so, you may have to ratchet up your parent-paid interest rate! Much better than the old one, but are you considering offering a card with the option to upload your own picture or even some different background colors/choices? Candidly, no. 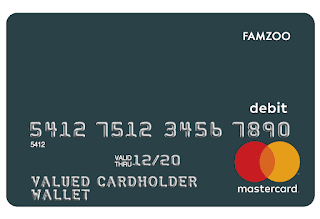 MasterCard has to approve our card designs, and our card processor does not support user-defined designs, so uploading your own picture is not being considered. We may offer a small number of choices on the background color. It's very hard to please a broad family audience with card designs, and our primary energy/focus goes into financial literacy capabilities and personal customer support, so I doubt we'll ever be heralded for our "cool" card designs :-) Also, kids lose their cards ALL THE TIME, so keeping costs super low there are paramount for our target audience. This is a good change. I almost went with another company at first because of the child-like design, but stayed because of the customer service. Anyhow, will there be a fee to switch? How do we get cards with the new design? They look great! What about a card with the security chip or support touchless? This is great - how do we switch current cards to the new design? love the new design. +1 on chip, apple pay. And how can we get the new one? Is there a charge to switch to the new cards? My kids hate the current ones but I just paid to replace them. I wish someone would've told me to hold out for the new design. Same! I would have been happy to wait a few weeks if I knew the design was changing. We've had the cards less than a month, and I like the newer card design MUCH better. How much is the fee to switch to the new cards? The new card design is exactly what you needed to do. I never liked how cheesy looking and obviously different they were from regular cards. Your post was funny. Mt 11 year old is on the cusp of being embarrassed by being associated with her parents, she'll appreciate this without knowing why. Please note that on route number 2, the current card is knocked out of commission for 7 to 10 business days. Regarding chipped cards: that's in process as an option, but they'll cost extra to order and replace. Kids lose their cards ALL THE TIME, so we'll retain the non-chipped option for those who want free replacements. Oh thank heavens. I am strongly considering getting your cards but the card design itself was perhaps my main obstacle. I knew it would never fly with my kid!